Most towns in Nevada County had their own concert band in the 19th century. It was partly local pride that kept it alive, but also the distances between towns were more difficult to travel. So the town� musicians gathered, formalized, entertained, and often competed as well. Brass bands with percussion were perfect for musicians whose hands were coarsened by mining and other hard labor. Sometimes bands became competitive, such as at California State Fair. At the extremely large 1893 funeral of Sheriff William H. Pascoe. three bands performed – the Grass Valley Band (also known as Green�s Band), Grass Valley Brass and Reed Band (also known as Jenkin�s Band), and the Nevada City Band – with each attempting to lead the procession, and then trying to drown out the other. 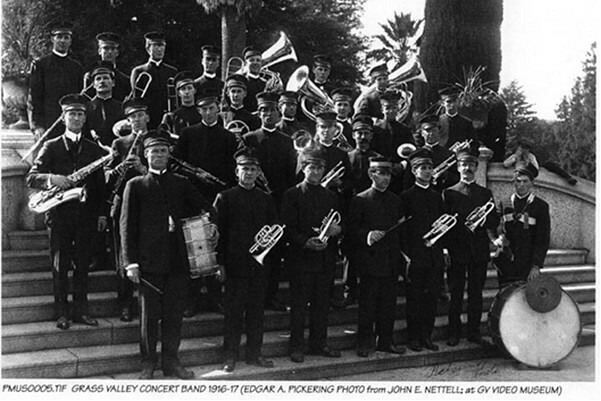 The Grass Valley Brass Band was formed under the leadership of Mr. Schmidtscheider to unify the various Grass Valley bands that existed at mines, clubs, schools, and service organizations. John Coad reorganized the Grass Valley Brass Band into a ten-piece group. Harry Green began leadership of what is now called the Grass Valley Concert Band, but commonly known as Green�s Band. Born in Cornwall and mined in Nevada, Green had been an original player in the Thomas Band. Under the direction of Professor Harry W. Hooper (who had formal training from San Jose Conservatory), the band entered a state-wide amateur competition in Sacramento. The band was apparently a sentimental favorite, composed almost exclusively of self-taught miners. Their pictured appeared on the front page of a Sacramento newspaper that read �Grass Valley Band Wins Second Place,� but they were really the best in the state (at least in memory). The band had continued success performing at state fairs, and at the 1915 Panama-Pacific Exhibition in San Francisco. For more information about the band�s activities for this period, go to the 1915 March link. (picture location: Sacramento) TOP ROW, LEFT TO RIGHT: Fred E. Nettell (1st trombone), Lester J. Richards (2nd trombone), E. L. Bosquit (1st trombone), O. L. Twitchell (G. trombone), A. M. Angove (bass), Lorin Kemp (bass), L. W. Hooper (B. B. bass); SECOND ROW: John Monahan (euphonium), Jack Kitchen (tenor), Ray George (alto), John Bradley (1st alto), Ed. Curnow (alto), Billie Winn (solo alto), John E. �Jack� Nettell (1st cornet); THIRD ROW: Edward B. Paynter (tenor sax), Leland V. Michell (clarinet), Burt C. Bridges (1st clarinet), Joseph DuCotey (2nd clarinet), Tom Wills (soprano cornet), James Andrews (1st cornet), Frank Colvin (2nd cornet); FOURTH ROW: Walter Hyatt (snare drum), Charlie Carveth (solo cornet), A. E. Hooper (solo cornet), Professor Harry W. Hooper (leader), Harold J. George (solo cornet), Will T. George (2nd cornet), Norton Penrose (bass drum and cymbal) – and the boy in the right background is unidentified. Leadership changed to Harold J. George for the next 40+ years. Under his baton, the band would play a concert every Saturday night during the warm months at the bandstand at the Grass Valley Park. He also directed the Grass Valley Carol Choir in the 1920s, a group with which he had sung since boyhood. Grass Valley Veterans Memorial Building �Grand Opening Festivities� The ten-piece band provided opening festivities, then dance music to a crowded dance floor of 750 couples with 500 additional spectators. At intermission, the Legion representative spoke, and American Legion Drum & Bugle Corps performed a stirring march in full uniform, followed by a selection from the concert band. As the lights dimmed, a bugler performed taps in honor of the service men who had lost their lives in battle. The party continued, and more than 300 people were served a midnight supper by the ladies of the American Legion Auxiliary. Grass Valley Veterans Memorial Building �Formal Dedication Ceremony� Starting off the ceremonies were the American Legion Drum & Bugle Corp (Hague-Thomas-Hegarty Post 130), the American Legion, and the Grass Valley Concert Band, who marched from the Elks Lodge to the Veterans Building. The dedicatory address was presented by Lieut. Col. E. J. Murray, Adjutant General of the California National Guard. Mrs. Talbot of Nevada City sang the �Star Spangled Banner.� Other musicians during the ceremony included singer Louis Hooper, the American Legion Auxiliary Glee Club, and the Post bugler Jack Nettell (also a member of the Grass Valley Band). Also part of the program was a pageant performed by twelve children, directed and arranged by Auxiliary chaplain Mrs. Luther Marsh. Here�s a picture of the band performing in downtown Grass Valley. Harold J. George, is at the podium, with his cornet at the ready in front of him for a few hot licks. Gold may have been king in the late 19th century, but the Nevada County area had plenty of room for brass. Just about every town during that time had at least one brass band with members playing such instruments as the trumpet, cornet, trombone, baritone, french horn, tuba, clarinet, and drums. A 1995 article from Sierra Heritage magazine declared: "It seems we can't imagine a time without brass bands in our Sierra communities." And certainly enough, brass bands played an important role in the history of California's gold mining towns. They provided entertainment, musical education and a focus for civic pride. For example, in 1861, the Grass Valley Brass Band performed during Nevada City's Fourth of July celebration. The director was a Mr. Schmidtscheider who according to the next day's Nevada City Morning, was "in the full uniform of a Major de Tambour (drum Major), the duties of which office he executed with consummate ability and presented a most soldierly appearance." The Band reorganized five years later under Cornish miner John Coad. The hit makers of the 1890s were folks like Patrick Gilmore, Arthur Pryor and John Philip Sousa and small-town bands were everywhere, which led to band contests. In 1914, the Grass Valley Concert Band won both a first- and a second-place award at the California State Fair, according to Sierra Heritage, "besting arch rival Nevada City." Other mining-town bands of that era included the Grass Valley Brass and Reed Band, Grass Valley's Star and Crescent Band, Nevada City Boys Band, Forest City Brass Band, Eureka Brass Band, Quincy Brass Band, Sierra City Brass Band and Sierra Buttes Brass Band. It is fair to say Sierra City had a bubbly past. On Sundays in the summer and early fall, bands would march through town and stop in front of the store fronts, including the pubs, and play. Afterwards, the barkeeps would serve free beer; and, by the time the band reached the lower end of town, according to Sierra Heritage, "bubbles of excess carbon dioxide from beer consumed issued from the horns, and ... there were noticeable slurring of the notes." Nevada County's town of Washington had a band too. The caption under an 1866 photo of the group said the town "was always proud of its mountain culture in spite of a rough and tough mining background." Boca, a town east of Truckee that's now underwater, had a 10-piece band. By the 1920s and '30s, music tastes changed, and the entertainment dollar was stretched thin by the Depression. Bands continued to perform at civic events, but music education and band programs were increasingly taken on by local schools. Boca was a former settlement in Nevada County, not far northeast of Truckee. circa 1890s, identifying with their leader John Jenkin�s name, who was featured as a solo cornet player. Since the name �John Jenkin� was fairly common, continuing history of this musician is hard to track. Known to be in existence in 1867, this was a colored band under the leadership of Dennis Carter. Note: this was before the word �city� was added to Nevada City. North Bloomfield (also called Humbug City) is a small unicorporated community in Nevada County that is now within the borders of the Malakoff Diggins State Historic Park. North Columbia was a California gold rush town on the San Juan Ridge in Nevada County. Organized by Will T. George to lead the Grass Valley�s Donation Day parade in 1907. Will also played cornet in the Grass Valley Concert Band. Most of the teenagers who had played together in this band eventually joined the Grass Valley Concert Band. Circa 1870, they identifying themselves on their leader Stephen Thomas� name, and later by his brother John Thomas, and consisting primarily of Cornishmen. The band played �A Fantasia of National Airs� at the national�s centennial event in 1878, and in another year performed a combined number with a 200-member children�s chorus. On yet another year, they played their �Christmas Welcome� at the corner of Mill and Main Streets in conjunction with John Ferrell�s Carol Choir. Harry Green was an original member of this band, and went on to lead the Grass Valley Concert Band in the 1890s. Picture is dated July 1866 across the main street in the town of Washington. Organized in 1862 under leader Mr. Philip Goyne, it was �kindly and favorably known throughout the county,� and �was always proud of its mountain culture in spite of a rough and tough mining background.� Original members were Philip and John Goyne (miners), John McBean (saloon keeper), A. W. Potter, Dr. H. F. Wilkinson (miner), J. H. Adams (miner), and John W. Brown (miner).